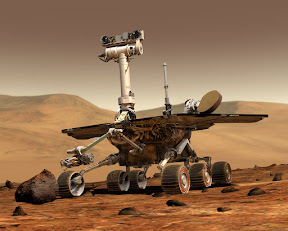 If NASA can stick an R/C rover on Mars, it won't be that long until self-driven cars are available. Image from Wikimedia Commons. Anyone who has ever driven a road trip will attest to wishing that cars were self-propelled. There have been countless science fiction books, TV shows and films that have featured something along those lines. Currently, an Italian team from VisLab, of the University of Parma, is guiding two self driven vehicles from Parma, Italy, to Shanghai, China. The project, called The VisLab Intercontinental Autonomous Challenge, is a 13,000 kilometer (8,000 miles, give or take), three-month journey with no human driving needed. Cars that don’t need to be driven have been a goal of engineers for decades. Attempts have been made since 1977, when Toyota had some initial success. The Defense Advanced Research Projects Agency or DARPA, part of the Department of Defense, held three competitions for self-driven automobiles, where engineering teams compete for up to $2 million in cash for completing a complex course, urban or off-road, in the best time, with the least difficulty. The University of Parma decided that the DARPA challenge, which lasted a scant few hours, wasn’t realistic enough. The VisLab, or Artificial Vision and Intelligent Systems Laboratory of the University of Parma, decided to put together a challenge on its own. Two electric vehicles (no gas is being used) were customized with sensors and other gear for autonomous driving. The lead vehicle has passengers, who drive in areas without GPS coverage. The second vehicle follows by sensor, needing no override in any case. The path has gone through city traffic, over the Ural mountains and into the desert of Western Asia. The team left Italy in July, and is now entering Kazakhstan. The cars should arrive in Shanghai by the end of October. Considering the amount of computer technology already in cars, a computer driven car that uses GPS is not a gigantic imaginative leap. The applications are legion. Farmers could harvest without leaving their living rooms. Drunk driving would never happen again. Calm and serenity would envelop the highways, making road rage a thing of the past.